The Name of the Wind was an interesting fantasy novel. This is the story of Kvothe, in his formative years. Some parts were longer than necessary, others just flew by. Overall, though, I enjoyed this story! We are introduced to a humble innkeeper and his helper. He enjoys his patrons, and the stories, but something is just missing. Bast, his helper, is concerned about the wellbeing of his "master" but can't do anything about it. We learn the innkeeper, called Kote, has lived a much more exciting life than he has let on when he starts detailing his life to a Chronicler. This book was long, I mean very long. Many characters come and go, but some stick around. Once we get into the story, we find out that Kote is actually the 'Famous' Kvothe, and this is his biography. His childhood is touched on, his admission and training at the University, his strengths and weaknesses – but we never really know HIM. We're told the story as we go, and much is left unexplained. I need to know what happens with his romantic interest, Denna. The world of Kvothe isn't much different than ours, the world building has a few differences, mostly in animals. The magic is more realistic than what I was expecting, and the characters were relatively down-to-earth. This isn't the story of a group of people setting out on an adventure. This is the account of a hero and how he became what he was known as. I'm not ready to start the second book as I need much more time than I currently have to get involved in this world. I will definitely pick this series up when I'm ready to immerse myself! 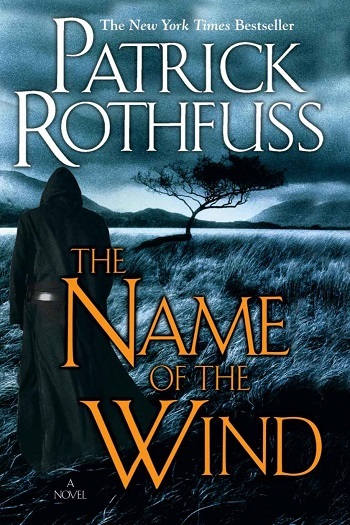 Shelby reviewed her personal copy of The Name of the Wind (The Kingkiller Chronicle #1) by Patrick Rothfuss for this post.